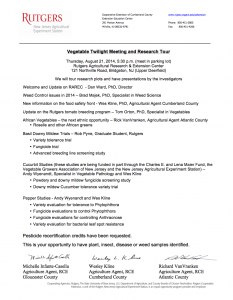 Join Rutgers for a twilight meeting in the field to learn about recent innovations for successful control of key vegetable diseases and weeds. Pesticide credits have been requested. This is your opportunity to bring plant, insect, disease or weed problem samples for identification. Rutgers Cooperative Extension Ag Specialists and County Agents will be on hand for the field tour of research and demonstration plots on managing diseases of pepper, basil downy mildew, and cucurbit downy mildew. View weed control innovations and get updates on tomato variety development and ethnic African vegetables.